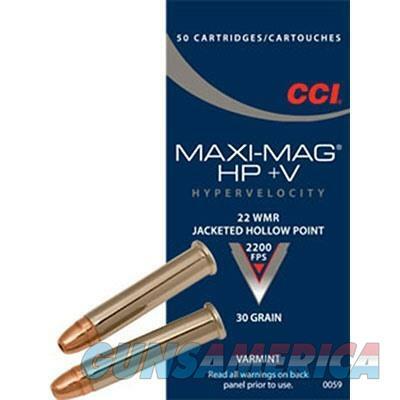 CCI Ammo 22 WMR HP Maxi-Mag+V 30gr. Description: Cci/Speer 59 MAXI-MAG HP +V AMMO 22 MAGNUM (WMR) 30GR JACKETED HOLLOW POINT CCI's varmint lineup offers several loads in a variety of calibers that utilize unique bullet technologies to deliver what we covet most: devastating performance on varmints, time after time. If you can't find your ideal rimfire varmint load on these pages, it doesn't exist.